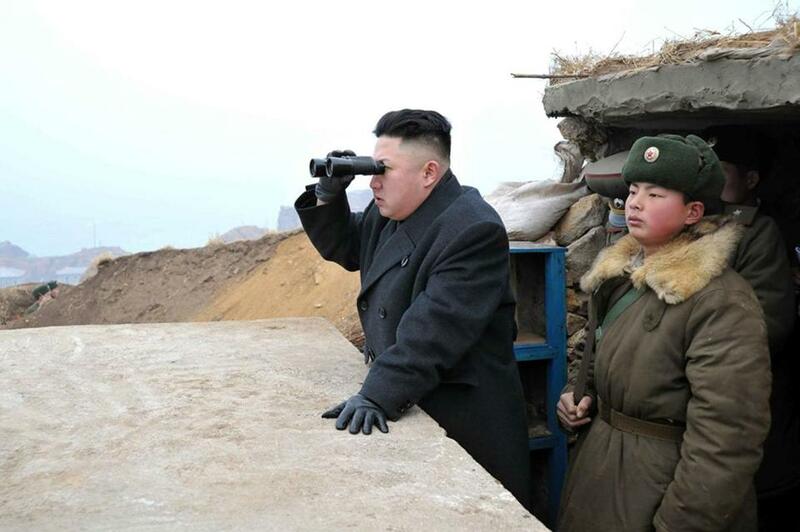 Kim Jong Un, shown looking at South Korea’s territory from an observation post earlier this month, ordered all the missile units in North Korea to be on standby last week. SEOUL — North Korea, reiterating that it considered the Korean Peninsula back in ‘‘a state of war,’’ threatened Saturday to shut down a factory complex it jointly operates with South Korea that stands as the last significant symbol of cooperation. The industrial park, the eight-year-old Kaesong complex in the North Korean border town of the same name, is a crucial source of badly needed cash for the heavily sanctioned North. It funnels more than $92 million a year in wages for 53,400 North Koreans employed there, and its operation has survived despite years of military tensions. The latest threat to close down Kaesong came amid a torrent of bellicose statements by the North in recent days, widely seen as a strategy to increase pressure on South Korea and the United States to soften their policies on the North. Although South Korean officials reasserted that they were ready to retaliate if the North committed any military provocations, they said they saw no imminent sign of any such attacks. On Saturday, cross-border traffic operated as normal, allowing hundreds of South ­Koreans to travel to and from Kaesong. “The South Korean puppet forces are left with no face to make complaint even though we ban the South side’s personnel’s entry into the zone and close it,’’ North Korea said Saturday in a statement carried by its official Korean Central News Agency. It said its dignity was insulted by South Korean news reports that suggested the North kept the complex open to obtain hard currency. In another development, some of the North’s main government-run websites were disabled Saturday in what news media reports said were cyberattacks. North Korea Tech, a website that monitors Internet activities on the Korean Peninsula, said the problems appeared ‘‘to be part of a loosely coordinated effort by hackers to target North Korean sites.’’ By late Saturday afternoon, North Korean officials had not confirmed any attacks on government-run websites. The problems come as some analysts suspect that cyberattacks have become an increasingly frequent weapon in the intensified sparring between the Koreas, although each side denies hacking the other. North Korea has been angry ever since South Korea and the United States started a joint military exercise in early March. Its bellicosity further escalated when the United ­Na­tions imposed more sanctions against it after its Feb. 12 nuclear test. The North has since declared an ‘‘all-out action’’ against Washington and Seoul and said that the armistice that stopped the Korean War in 1953, as well as all nonaggression agreements with the South, were nullified. Last week, it cut the last remaining military hot lines with Seoul. Its leader, Kim Jong Un, ordered all his missile units to be on standby and if provoked, attack the United States and South Korea with nuclear-tipped long-range missiles, ­although most analysts doubt the North has them.